Lemon rosemary chicken with roasted potatoes. This is Italian comfort food. It’s easy enough to make during the week but good enough to share with friends. With foodie friends. It’s adapted from the lemon rosemary chicken in Michael Chiarello’s Tra Vigne Cookbook. I’ve cut back on the lemon and added a sprig of rosemary when roasting the chicken. I’ve also added a swirl of butter at the end to enrich the sauce. If you have some concentrated chicken stock it adds a nice touch too. Just add in a few tablespoons worth to put it right over the top. Broiling the lemons mellows their bite. It’s not essential – but nice to have. If you skip this step, cut back the lemon. Maybe half a lemon. Maybe a bit more. Depends how lemony you like it. Cut the ends off the lemon if you do broil it. This gives it a “stand” on which to balance. Makes broiling lemons way easier. You can do all the prep ahead of time. If you do, this is just a simple skillet dinner. Perfect for a dinner party. Easy. Par-boil the potatoes and broil the lemons ahead of time. You’ll have time to chat with your guests. Enjoy a glass of wine. I wouldn’t serve lemon rosemary chicken with anything other than the chicken and potatoes on the plate. Mound a few potatoes in the middle of the plate. Lean the chicken on the potatoes and drizzle a bit of sauce all around. Garnish with a bit of chopped chives if you want. Serve. Enjoy. Roasted lemon, rosemary, garlic and potatoes. Classic flavours come together in this skillet chicken dinner. Cut off the ends of the lemon, then cut the lemon in half. Broil the lemon for about 10 minutes, until beginning to char. Squeeze the lemon through a strainer, pushing on the pulp. Reserve lemon juice. Turn off the broiler and pre-heat your oven to 425F. Boil the whole new potatoes in well salted water until just tender, about 10 minutes. Set aside to cool. Reduce two cups of chicken stock by half. If you have some chicken concentrate this is a great place to use it to really boost the flavour. Add in a couple tablespoons worth. 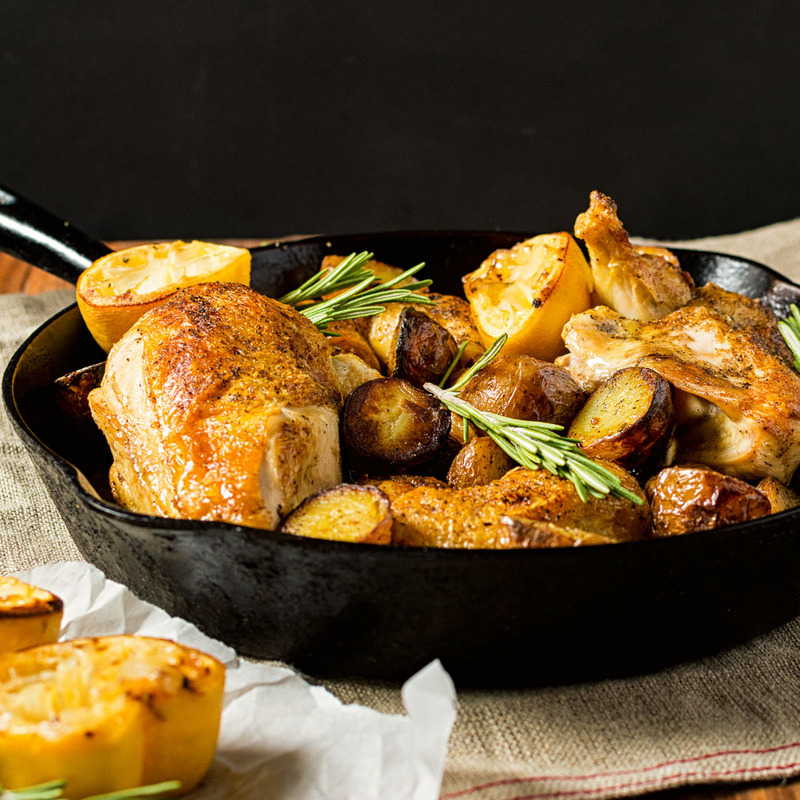 In a skillet large enough to hold the chicken and potatoes heat olive oil over medium heat. Rub the chicken with olive oil and season liberally with salt and pepper. Saute the chicken, skin side down until golden brown, about 5 minutes. Remove chicken. Add the potatoes to the hot oil and saute, stirring to flip potatoes occasionally, about 5 minutes. Remove potatoes from the skillet and pour off the oil. Place the sprig of rosemary in the bottom of the skillet. Place chicken over top then sprinkle the potatoes around the chicken. Roast the chicken in a 425F oven until the white meat reaches an internal temperature of 165F. You want 175F on dark meat. Legs tend to be smaller so they will probably reach 175F before the breasts reach 165F . Don't worry too much about it. The legs will be fine if you overshoot a bit. 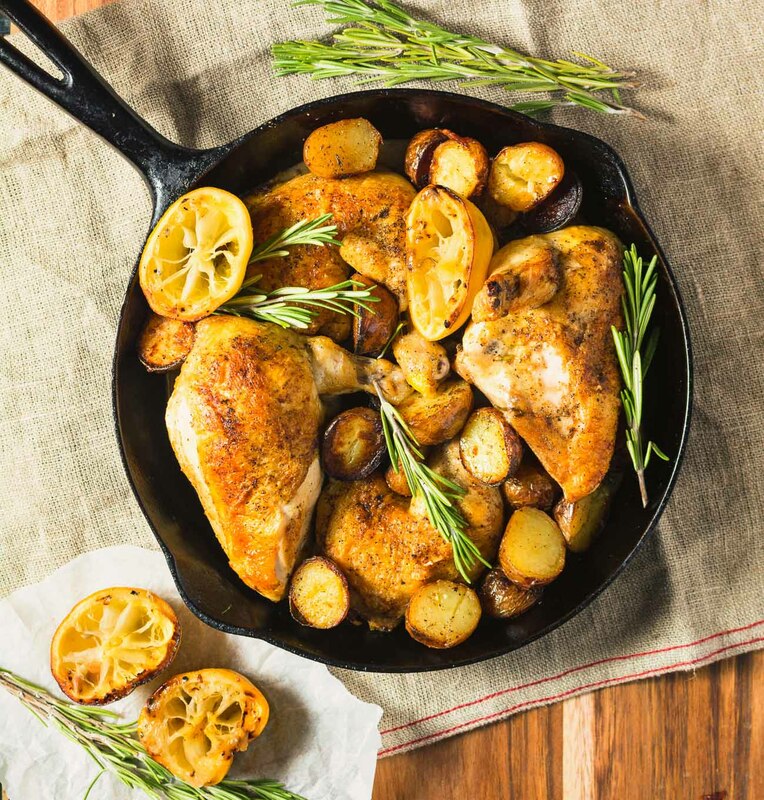 Remove the chicken, potatoes and rosemary from the pan. Place pan over medium heat. Add the garlic, parsley and rosemary and cook briefly, being careful not to burn the garlic. Add the reserved lemon juice and reduce until you get close to a syrupy graze. Add the stock (and some concentrated chicken stock if you have it) and reduce slightly. Return chicken and potatoes to the pan and place in the oven to heat through, about 3-5 minutes. If you want to put it over the top, swirl in a couple tablespoons of butter off heat to enrich. The skin on that chicken looks so nice and crispy, and the potatoes have that nice browning to them. And rosemary is one of my most favorite herbs, so this is a real winner. 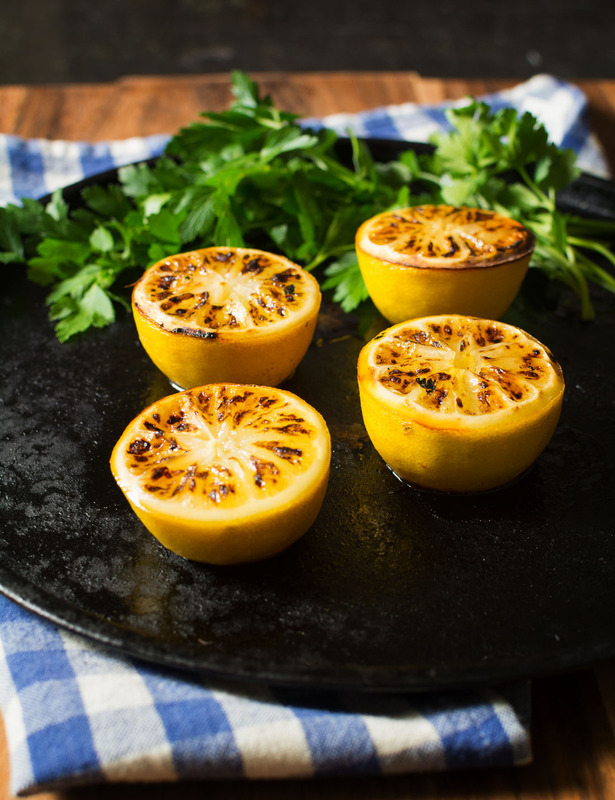 Love the tip on broiling the lemons…I just planted a lemon tree, so this looks like a good use! I’m very jealous. There’s no way I can have a lemon tree where I live. Oh man, I love lemon anything. This looks like a great dinner party dish! Thanks for posting, Romain! Yum! Lemon and chicken– such an awesome, classic combination. Love the addition of the potatoes to round out the meal. Can’t wait to try this! I think the potatoes are the best part. They really soak up the chicken flavour. 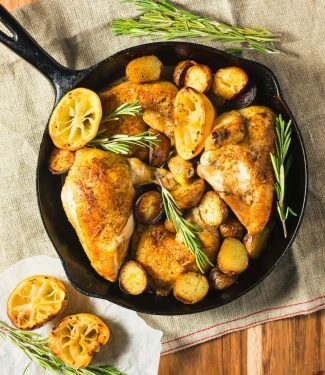 I love the flavor combination of lemon and chicken, adding rosemary sounds wonderful. I can’t wait for spring to come and revive my rosemary in the garden! In the past, I tried a lemon turkey and I botched it up so badly that I was afraid to even go near lemons and poultry. (apparently it tasted like pure lemon because I put way too much zest in it haha But this recipe looks absolutely gorgeous. The crispy chicken skin and the amazingly crispy looking potatoes! I will put aside my fears because I have complete confidence in you that you will show me the right way 🙂 Looking forward to making this recipe. Wow. That’s incredibly nice. If you are scared of too much lemon remember that adding butter at the end tempers the lemon. Roasting the lemon mellows it some as well. We made this delicious chicken meal tonight and it was a hit with the family. Rosemary and lemony goodness. I’m glad you liked it. Rosemary, lemon and chicken are a combination that’s hard to beat!